The famous portrayal of Tyrannosaurus rex chasing a speeding jeep in Jurassic Park is scientifically disputed in this week's Nature. In their paper entitled "Tyrannosaurus was not a fast runner," John R. Hutchinson and Mariano Garcia of the University of California at Berkeley present a model that indicates T. rex's running speed was between 5 to 11 meters per second (11 to 25 miles per hour). This speed is considerably slower than the previously estimated speeds for T. rex, ranging from 11 meters per second (25 miles per hour) to 20 meters per second (45 miles per hour). The model Hutchinson and Garcia created estimates the minimum mass of extensor (supportive) muscle required to enable an animal to run quickly on two legs. They expressed the required extensor muscle mass for fast running, where both feet in mid-stride are off the ground, as a percentage of body mass. Animals without sufficient leg muscle could not run bipedally. The researchers looked at several organisms, including an alligator, a chicken, a Coelophysis (a small dinosaur known to be capable of running), a small T. rex and an adult T. rex. The alligator, chicken and Coelophysis validated the model. The alligator had only 3.7 percent body mass per leg; to run it needed 7.7 percent body mass per leg. The chicken needed only 4.7 percent body mass per leg to run and was found to have 8.8 percent per leg as extensor muscle, nearly double the amount required. For T. rex, the model showed that in order to be a fast runner, it would need approximately 86 percent of its body mass to be extensor muscle (43 percent per leg). The current knowledge about the size and shape of T. rex shows this is not the case. 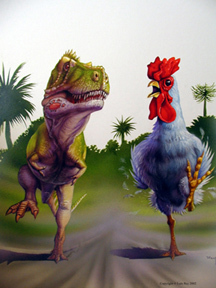 Using isometric scaling, the two further illustrated the inability of T. rex and other large dinosaurs to be fast runners. Their chicken model was isometrically scaled up to 6,000 kilograms. At that size and with normal limb orientation a chicken would require 99 percent body mass per leg as extensor muscle in order for it to be a fast runner, a physical impossibility. From these results, Hutchinson and Garcia concluded that T. rex and other large dinosaurs were poor runners. To overcome the number of unknowns in the model, such as the penetration angle of muscle fiber, Hutchinson and Garcia changed unknown parameters to determine what effect they have on the results. Andrew Biewener of Harvard's Concord Field Station complimented the authors for this use of sensitivity analysis, in an accompanying article in Nature. Using this technique, Hutchinson and Garcia discovered that most of the unknowns did not have a significant effect on the outcome, except they did find that the limb orientation made a significant difference in the model. "A Tyrannosaurus needs a lot more muscle mass to run quickly if it used a crouched pose than if it used a more columnar pose. But in either case, we felt we could rule out 45 miles per hour running. It required too much muscle mass," Hutchinson says. Fossil tracks exist that show smaller dinosaurs ran fast, but so far paleontologists have not found running tracks of carnivorous dinosaurs the size of T. rex. Julie Day of the University of Cambridge reported in Nature recently about tracks of a running dinosaur one-third to one-fifth the size of T. rex. She estimated its speed was 8 meters per second (18 miles per hour). This speed falls in the middle of the range suggested in Hutchinson's paper, but he points out that speed estimates from tracks are often imprecise and the margin of error can be 50 percent. He also noted that Day's tracks were 163 million years old, while T. rex lived 65 million years ago. "If you watch closely, the vehicle is shifted into second, third then fourth gears, implying a speed of 40 or more miles per hour. The actors are screaming, the music is dramatic, the Tyrannosaurus is roaring, and the editing cuts quickly between cameras. Take a closer look at the Tyrannosaurus motion, though, and you spot some incongruities. It always has one foot on the ground, and the cadence of its footfalls is rather slow, less than two steps (one stride) per second. To be moving over 40 mph with such slow strides, the Tyrannosaurus would have to have been taking ridiculously long steps. A casual survey of the movie shows this is not the case. The conclusion (first pointed out by scientist Stephen Gatesy of Brown University, and acknowledged to us by the moviemakers), is that the scene (Tyrannosaurus and all) was only moving at around 10 to 15 mph! Our eyes are easily fooled by movie magic into thinking that the Tyrannosaurus was faster. Why didn't the filmmakers just have the Tyrannosaurus moving 40+ mph? Those basic biomechanical principles of size and locomotion just wouldn't allow it to 'look right' to our eyes. The scene would strain credulity, and our research shows why."